I started this book during the Read-a-Thon, and thanks to all the reading time I got on RAT weekend, I was able to finish the book last night. That's pretty good, as my copy was 741 pages long! Usually, that would take me a good month to finish. The copy I read was one that I Mooched several years ago. It was a big, heavy hardback, and I've been carrying it around in my purse, so I was very happy to finish it in about a week. While I've really enjoyed reading this series, this wasn't one of my favorites. Ayla and Jondalar have finally reached Jondalar's people, the Zelandonii, in the far west of the country. This book details Ayla's introductions, not only to Jondalar's immediate family in the Ninth Cave, but to the rest of the people in other Caves, as well, through the Summer Meeting. I'm not sure what it was about this one, but it kind of bored me. Maybe it was that they were no longer traveling, or that not much really seemed to happen in this one (ah, those days of domestic tranquility), but I was not as captivated by the story as I have been in the past. While I've complained in the past about a bit of repetitiveness in the writing, it seemed more obvious than before in this book. Auel would explain something, have a character TALK about what she JUST EXPLAINED and then reference it again a few pages later. And, while the research she puts into these novels is more than apparent, sometimes I feel like we get a big infodump with paragraphs and paragraphs of lectures on prehistoric science or biology. This one, unfortunately, only gets 3.5 out of 5 Whatevers. It's a good one if you're following the series, but not even the birth of Ayla's child at the end of the book could spice it up for me. Which hour was most daunting for you? Definitely Hour 17, because I kept dozing off over my book! Could you list a few high-interest books that you think could keep a Reader engaged for next year? A couple of Read-a-Thons ago, I read some of the Lonesome Dove series. Those were good for the RAT. But, really, anything you're into is good. Do you have any suggestions for how to improve the Read-a-thon next year? None...it was so good this time around! What do you think worked really well in this year’s Read-a-thon? Love that they brought back so many random reader prizes (even if I didn't win any) and kept all the mini-challenges, etc. How many books did you read? One magazine and part of one book. Which did you enjoy least? Every Day with Rachael Ray, but it was still good. If you were a Cheerleader, do you have any advice for next year’s Cheerleaders? I was not an official Cheerleader, but I did pop around to people's blogs to cheer them on. Getting cheerleading messages is fun. How likely are you to participate in the Read-a-thon again? What role would you be likely to take next time? Oh, I definitely will be reading again in April!!! What I've eaten/drunk: two Ooey Gooey Chips Ahoy cookies (RAT breakfast of champions, baby! ); a bottle of water; 1/4 of my leftover Obscenely Loaded Fries from Hurricane Wings (lunch the other day); Publix cola; a couple of pimento-stuffed green olives; TGI Friday's sliders (for lunch); some gummi bears; a bottle of water; the rest of the gummi bears; two-thirds of the remaining Hurricane Wings cheese fries; another Publix cola; leftover pad see-ew from lunch yesterday; some frozen pizza; a bottle of water; gum; some gumdrops; BEST SNACK OF THE DAY - TGI Friday's potato skins; a Diet Mt. Dew (because when you eat all that junk, you need a diet soda). Thanks SO MUCH to the organizers, Cheerleaders, Angels, donators of prizes, participants, and just EVERYONE who makes this event so much fun twice a year. You've made April and October two of my favorite months of the year, and you've helped my husband get back into reading. And thank you most of all to Dewey, whom we miss so much. Without her, we wouldn't have this event. See you all in April! Getting more tired. The Diet Dew is helping, though. I'm gonna push on. Let's see how much longer I can make it. I'd really love to see 2 AM. Haven't made it that long in the Read-a-Thon in YEARS. Anyone else had their best snack of the day yet? What was it? Getting more tired. Might be almost time for some soda to wake me up. Hoping I get my second wind soon, because I wanna make it another four hours or so! What do you do when you start to get tired? Caffeine? Activity? Prop your eyelids open with toothpicks? Yes, a bit. But I am going to keep on pushing through! One magazine, so far. That I'd started before the RAT. Soooo, not so much progress. But my current read is LOOOOONG. And I don't really base my success at how many books I finish, since I tend to favor chunksters. Definitely my book, The Shelters of Stone. I've found a ton of new blogs! But there are so many that I can't list them all here. So see my previous post, where I list all the people I've visited. There. That was nice and lazy of me. I'm starting to get a little tired, although I'm trying to ignore that fact. I'd like to last at least six more hours, but I'm not sure that's gonna happen. I used to be able to stay up superlate on the Read-a-Thon, but I'm getting older and my body needs its sleep. ESPECIALLY because I've been sick this week. So. We shall see how far I get. Cheer me on, please!!! One-third of the way through! Woo hooooo! As you can probably tell, junk food is very important to me during a Read-a-Thon. I try to stock up beforehand, so I can fill any particular craving I might have. I've got the aforementioned potato skins in the freezer, frozen pizzas, pretzels, almonds, popcorn, soda, candy out the wazoo...basically anything junk-foodish, we've got it on hand. What do you like to eat during the Read-a-Thon? Are you a junk food junkie like me, or do you like to keep it healthy? 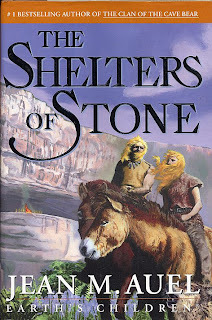 I'm getting into my second read of the RAT, Jean Auel's The Shelters of Stone, which is one of the Earth's Children series. I've read all the previous volumes, so now I have this one and the newest volume left to go. I don't have a copy of the new one, The Land of Painted Caves, but I'll probably borrow it from the library in order to finish the series. I don't see myself finishing The Shelters of Stone, but if I do, I have a Kindle book, Perfectly Matched by Heather Webber, ready to go (as well as several others on my book pile!). What are you reading today?! Blogger is being a bit temperamental. I think all of us Read-a-Thon-ers are overloading it. But I made it back in time to get a post up this hour. Just finished my magazine and I am about to start my book, The Shelters of Stone by Jean M. Auel. Here is my standard Read-a-Thon update meme, detailing what I've accomplished during Hours One and Two. We're heading into Hour Three now and I'm in top form!!! I started out a bit headachey from eating too much sodium yesterday (damn you, pad see-ew), but I popped a couple Excedrin Migraines (my happy pills) and was ready to go. Also I had a bit of a stall about halfway through when I got something in my eye and I had to stop to try to get it out, but that's all over with. Now I'm going to cruise on over to a few participants' blogs and try to finish my magazine before my next break at the beginning of Hour Five! Happy reading!!! 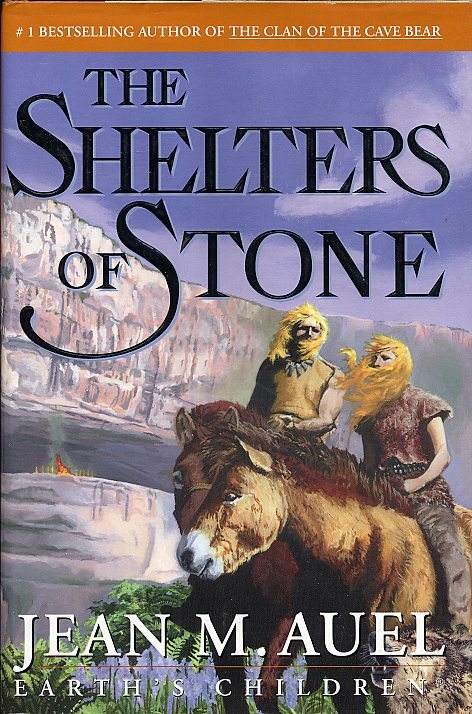 The Shelters of Stone, which is probably the only one I'll get around to reading. I have some potato skins that sound mighty good. I'm a lawyer, I'm married, and my husband is participating in this Read-a-Thon, too. I've done about nine Read-a-Thons before today, so I have my routine down pat. I don't think I'll do much differently. Maybe sleep more, since I've had a cold this week. Tomorrow is the Read-a-Thon, tomorrow is the Read-a-Thon! My favorite time of year!!! This will be my ninth RAT, I think. I've got books stacked up, junk food and soda waiting, and I'm going to try to get to bed at a reasonable time tonight, so I can be fresh and ready in the morning. I've had a bad cold all week, so I'm not sure how much reading I'll get done tomorrow, but I'm finally starting to feel better, so hopefully I can make it through my usual 13 to 18 hours of Read-a-Thon-ing. Can't wait! I am planning on reading The Shelters of Stone most, if not all, of the day. Are you participating in the Read-a-Thon? What are you reading? This book is one of a triumvirate of books that I ask for every Christmas. I received this one for Christmas in 2010, and it's been sitting on my shelves for a year and a half or so, waiting for me to get around to reading it. And now I have! 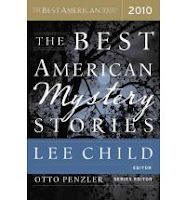 I love this series, especially the mystery stories. The criteria for submitting a story to this volume is that a crime or the threat of a crime must be central to the story. Over the years, this requirement has resulted in some truly surprising stories, and 2010's installment was just as interesting as these volumes usually are. The book has the top 20 submitted stories, chosen by a team of readers, narrowed down by the series editor, and the final selections made by the guest editor, in this case Lee Child, author of the Jack Reacher novels. Far and away in this collection, my favorite story was Jay Brandon's "A Jury of His Peers." This story combined two of my favorite things: law and the Old West. It is based on a true incident, when the Spanish army kidnapped all the lawyers in San Antonio and held them hostage, during the Spanish-American War. This story deals with the aftermath. What happens when the lawyers return? Specifically, what happens to the men who have moved in on their practices (and, in some cases, their wives)? While all of the other stories were very deserving of being included, I also especially enjoyed Lyndsay Faye's "The Case of Colonel Warburton's Madness," a Sherlock Holmes tale, done very well; Phillip Margolin's "The House on Pine Terrace," about a policewoman's affair that turns in on itself; and the late, great Kurt Vonnegut's "Ed Luby's Key Club," about a man seeking justice for himself in a town owned by another. As usual, this collection was fantastic. I'd give it four out of five Whatevers. Perfect for the upcoming Read-a-Thon, for those who are looking to get more into short stories or those who already love them, and absolutely meant for mystery lovers. Please do yourself a favor and check out this series. The next classic short story might be in here!